When buying your bathroom online, it's important to get the size right. In this guide, we demonstrate how to measure for your shower tray. Simply replacing new for old? In this instance, measuring for your new shower tray should be a simple matter of taking the dimensions of your old shower tray. Take a good firm hold of your trusty old tape measure and note down the length and width of your existing tray." If you are replacing like for like, and simply installing a brand new shower enclosure, it should be just a simple matter of measuring your old shower tray. Grab a hold of your trusty old tape measure and take the measurements along each side to find the width and length. If it's a quadrant shower enclosure, you will also need to find out the radius, and there is an easy way of doing this (as long as it's not an offset quadrant shower enclosure). Measure one side, this will give you the length, then measure from one side up to the point the line of the enclosure starts to arc. One way of accurately marking out the position of your new shower enclosure, is to draw it out on a piece of cardboard. Find a sizeable piece from an old household appliance box and, using its straight edges, mark out the shape of your shower enclosure using a tape measure. Simply place into position in your bathroom to give you an idea of the range of shower tray sizes available to you. This is particularly handy if you are planning on installing an odd-shaped shower tray such as a P shaped design. Handy hint: Thinking of fitting a walk in shower enclosure? 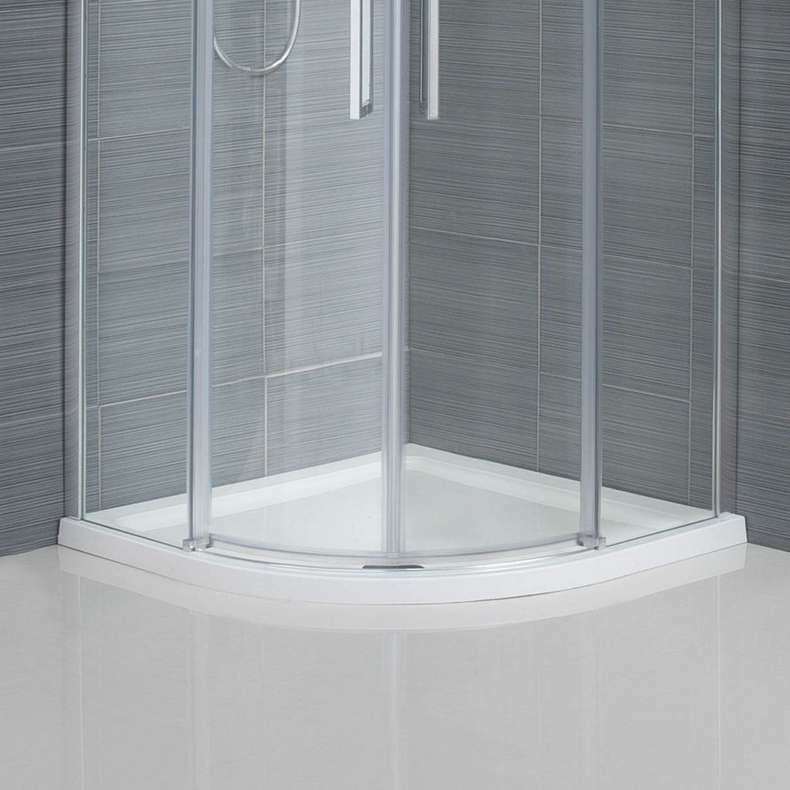 Check out our walk in shower tray buying guide. If you're a whizz with computers, or simply want to try your hand at something a little more challenging, why not use 3D planning software to plan your new bathroom? It's really not too difficult to master, and soon enough you'll have your very own 3D bathroom model. One very important thing to do when measuring for your shower tray is to ensure you know where your waste pipe is going. This is so that it lines up with the waste hole in your new shower tray. Whilst there are a range of shower tray sizes available, shower trays also come in varying heights. Most modern shower trays feature a low level design for ease of access, but if you wish to raise your shower tray up, you can use a shower tray riser kit. The kit comprises of adjustable supporting legs and a clip on cover, which also provides easier access to your plumbing for maintenance. If you're ready to purchase, why not browse our comprehensive range of quality shower trays? Your guide to buying the right walk in shower tray, how it differs to a normal shower tray, and what to look out for. With any renovation or redecoration task, measuring and planning your layout is a vital part of the preparation. So we’ve put together this short guide to help you get started. A shower tray is an essential part of creating a shower enclosure, keeping water where it should be and efficiently draining it away. This guide will give you a quick overview of what’s available at VictoriaPlum.com, so you can easily find the one that’s right for you.